Really. Ninety percent of deep sea marine life use some form of bioluminescence to either attract or repulse others, or to communicate. Since it's so dark down there, it's not surprising that bioluminescence using several distinct chemical mechanisms has evolved many times in the sea among a large number of only distantly related beasties. 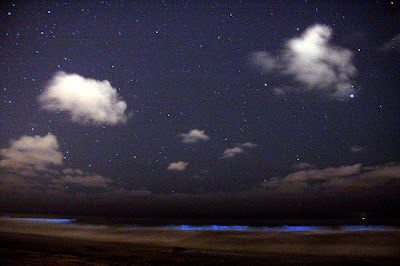 In 2005, warm "El Niño" water encouraged the growth of bioluminescent dinoflagellates (Lingulodinium polyedrum) along the Southern California coast shown here lighting breaking waves at midnight on our local Carlsbad CA beach. Under the right conditions, the dinoflagellates, more commonly known as plankton, become so numerous that the water takes on a muddy reddish color, hence the name "Red Tide." Bioluminescence is not the same as "fluorescence," which is energy from a light source that is absorbed and re-emitted. Bioluminescence energy is supplied by a chemical reaction between at least two chemicals—one that produces the light (called a "luciferin") and the one that drives or catalyzes the reaction (called a "luciferase"). Almost all marine bioluminescence is blue in color becuase it's more easily transmitted in blue water. A notable exception to this "rule" is Malacosteid family of fishes (known as Loosejaws), which produce red light and are able to see this light when other organisms can not.